Defamation remains a criminal offence in Portugal. Defamation (difamação, Art. 180): Alleging a fact or formulating a judgment (or reproducing such) about a third person that is offensive to that person’s honour or reputation. It is punished with a prison term of maximum six months or a fine of maximum 240 days. Per Art. 183, the penalty for defamation is increased by one-third if the act concerns the allegation of a particular fact that the offender knows to be untrue or committed with publicity. If the act was committed through the media, the penalty is increased to imprisonment for up to two years or a fine not less than 120 days. Insult (injúria, Art. 181): Alleging a fact or expressing offensive words directly to a person that is/are offensive to that person’s honour or reputation. Insult is punished with a prison term of maximum three months or a fine of up to 120 days. Per Art. 183, the penalty for insult is increased by one-third if the act concerns the allegation of a particular fact that the offender knows to be untrue or committed with publicity. If the act was committed through the media, the penalty is increased to imprisonment for up to two years or a fine not less than 120 days. False accusation (denúncia caluniosa, Art. 365): Publicly accusing or casting suspicion on a person of having committed a crime while knowing the accusation to be false. The penalty is imprisonment for up to three years or a fine. If the accusation is of a contravention (misdemeanour), the punishment is imprisonment of up to one year or a fine of up to 120 days. If the accusation results in the victim’s incarceration, the penalty is up to eight years in prison. Art. 184 of the Portuguese Criminal Code states that when defamation or insult is committed against a wide range of government and public figures in virtue of their function, the minimum and maximum punishments are raised by one-half. The list of figures covered includes members of Parliament, the Council of State, or the Ministry of the Republic; police and security service officers; public, civil, and military officials; judges, lawyers, witnesses, and jury members; ministers; and university professors. Note also that. 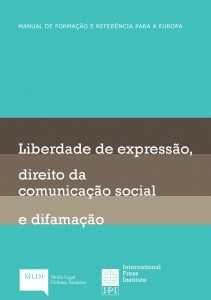 according to the Portuguese Criminal Code, prosecutions for insult or defamation (Arts. 180-183) can only occur at the behest of the offended party, except when the offended party is a public or government official or one of the institutions, corporations, or services named in Art. 187 (see under “Protection for the state, its institutions, or its symbols”). Art. 328 of the Portuguese Criminal Code punishes insult or defamation against the President of Portugal with three months in prison or a fine. If committed publicly or through the media, the punishment increases to a prison term of between six months to three years and a minimum fine of 60 days. Art. 187 of the Portuguese Criminal Code provides criminal liability for asserting false information “capable of offending the credibility, prestige or trust due to bodies or services that exercise public authority, collective persons, institutions or corporations”. The penalty is imprisonment for up to six months or a fine of up to 240 days. Additionally, Art. 332 punishes insulting the State, the national flag or anthem, or the symbols of Portuguese sovereignty, or failing to give the State or its symbols “the respect they deserve” with a prison term of maximum two years or a fine up to 240 days. Offending the honour of “protected persons” while such persons are in Portugal in the course of performing their official functions is a crime under Art. 322. The penalty is imprisonment for up to two years or a fine. According to this article, the category “protected persons” includes foreign heads of state, heads of government and ministers of foreign affairs, and the families of these persons. The category also includes representatives or officials of foreign states or international organisations who enjoy special protection under international law, as well as the families of these persons. Under Art. 323, insulting the flag or official symbol of a foreign state or international organisation of which Portugal is a member is punished with a prison term of maximum one year or a fine of maximum 120 days. Seriously offending the dead is punishable under Art. 185 of the Portuguese Criminal Code with a prison term of maximum six months or a fine of maximum 240 days, subject to the defences of truth and legitimate interest and the aggravating circumstances of slander. The statute of limitations is 50 years. Offending a person in virtue of his religious belief, or denigrating an object of religious worship in a way that could disturb public order, or vilifying a religious practice is punishable with a prison term of maximum one year or a fine of maximum 120 days (Portuguese Criminal Code Arts. 251-252). The following data were provided upon request to the International Press Institute by the Portuguese Ministry of Justice. • For the offence of defamation (Art. 180), there were 177 convictions, resulting in 162 criminal fines. • For the offence of insult (Art. 181), there were 574 convictions, resulting in 3 unconditional prison sentences, 6 suspended prisons sentences, and 526 criminal fines. • For the offence of defamation or insult committed publicly or via the media (Art. 183), there were 0 – 3 convictions . • For the offence of aggravated defamation (Art. 184), there were 71 convictions, resulting in 4 suspended prison sentences and 59 criminal fines. • For the offence of aggravated insult (Art. 184), there were 353 convictions, resulting in 3 unconditional prison sentences, 18 suspended prison sentences, 6 prison sentences replaced by a fine, 8 prison sentences substituted by community service, 299 criminal fines, 6 criminal fine substituted by work, and 8 reprimands. • For the offence of an offence toward an institution, corporation, organism or service run by public authorities (Art. 187), there were 9 convictions, resulting in 8 criminal fines. • For the offence of seriously offending the dead (Art. 185), there were 3 convictions, for which no punishment is registered. • There were 0 convictions and 0-3 persons charged under Arts. 251 (religious insult), 322 (defamation of protected persons), 323 (insult of flag of foreign state or organisation), or 332 (insult to the Portuguese State and its symbols). 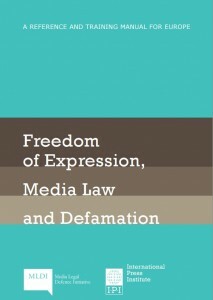 • In March 2010, the Coimbra Court of Appeal confirmed the criminal defamation conviction of two journalists working for the regional newspaper Jornal do Centro in Viseu. In 2002, the paper had published a news story and an opinion piece suggesting that a local court’s donation of used furniture to charity was marked by favouritism and a lack of transparency, noting that one private charity in particular had received nearly half of the pieces. The Coimbra Court ruled that “malicious insinuation” was not protected by freedom of expression and upheld criminal fines of €1890 and €2030. The defendants were further ordered to pay each of the plaintiffs – the secretary of the court and the private charity in question – €3500 in damages plus legal costs, which amounted to €3,480.48. The journalists appealed to the European Court of Human Rights, which in April 2014 issued a judgment in their favour (Amoris Giestas and Jesus Costa Bordalo v. Portugal, No. 37840/1 ). Ruling that the defendants had acted in good faith, the Court found that the news story in question was purely an “information article” that merely relayed true facts about the identities of those who had received the furniture pieces and transmitted the suspicions of other charities; and, furthermore, that the opinion piece was not only “based on facts, but also judicious as a civic contribution to a debate of general interest.” The Court also noted that the paper had dutifully sought and included reactions from the local court and the charity. Finally, the Court ruled that the punishment awarded by the Portuguese courts had been “disproportionate”, and awarded the defendants €11,752.90 (the combined fine, damages, and legal costs) plus an additional €5,000 in legal costs related to the ECtHR case. • In October 2010, the Lisbon Court of Appeal convicted on criminal defamation charges the director and deputy director of a Madeira-based satirical magazine, Garajau, over an article that scrutinised a purchase of some land by the vice-president of the Madeira Regional Government. The Court ruled that the defendants had not proved the truth of their assertions, and sentenced the pair to criminal fines of €2640 and €980, respectively. The defendants appealed to the European Court of Human Rights, which in December 2013 ruled in their favour (Welsh and Silva Canha v. Portugal, No. 16812/11). The ECtHR found that the article concerned a matter of public interest and that the magazine had acted in good faith in publishing it. • In December 2012, the Lisbon Court of Appeal acquitted Eduardo Welsh, then-director of Garajau, of criminal defamation after the magazine printed a cover drawing comparing the president of the Madeira Regional Government, Alberto João Jardim, with Adolf Hitler. According to news reports, the Court ruled that the majority of persons would understand the drawing as satire, and that although the image represented a “violent, exaggerated, and provocative attack”, it was directed at Jardim as a politician, not as a human being. The Court reportedly added: “Freedom of expression constitutes one of the fundamental essence of modern democratic societies. In such societies, public debate and freedom of expression should enjoy increased protection when relating to political questions or politicians themselves”. • In February 2011, a lower court sentenced an anonymous blogger to 133 days in prison and a €40,000 fine for insulting a journalist working for the magazine Sábado, Fernando Esteves. According to reports, the blogger, later identified by police through his IP address as a doctor from Portgual’s Avis municipality, had taken issue with a story written by Esteves alleging instances of patient abuse by doctors in the country. The blogger then reportedly authored several anonymous posts on the website ‘Médico Explica Medicina a Intelectuais’ (“A doctor explains medicine to intellecutals”), in which he expressed disbelief that this “disgust in human form whom Luther would have called a donkey-pope” could have had privileged access to health records held by the government and claimed that, among other things, Esteves evidenced “recidivist hatred” of the medical profession. The judge in the case reportedly ruled that the blogger “could have acted differently” and “had not correctly exercised his rights”. Esteves said after the verdict, “The judge preferred a very harsh sentence and I think she had the perfect notion of how to apply justice. The blogosphere cannot be a place where one can say everything without consequences.” In October 2011, the Lisbon Court of Appeal reportedly overturned the blogger’s conviction. Esteves himself, in 2008, was ordered by the Portuguese Supreme Court to pay EUR 12,500 in damages to the director of an AIDS charity, Abraço, whom he accused of specific acts corruption. The Court said none of the accusations made by Esteves had been proven, and more than doubled the damages amount awarded by lower courts. • In July 2010, the Lisbon Criminal Court convicted Carlos do Carmo de Portugal e Castro Câmara, a columnist for the newspaper O Independente of criminally defaming the president of the Portuguese Meteorological Institute in an opinion article published in March 2006. The article called “The Liar”, was published in response to denigrating comments the Institute’s president had made about the columnist, who also previously worked for the Institute. Do Carmo de Portugal e Castro Câmara was sentenced to pay a fine a of €2,000. In February 2011, the Lisbon Court of Appeal upheld the decision. In 2016, however, the European Court of Human Rights found a violation of Art. 10 of the ECHR, ruling that the Portuguese courts had “failed to strike a fair balance between the relevant interests and to establish a “pressing social need” for putting the protection of [the Institute president’s] reputation above the applicant’s right to freedom of expression (Do Carmo de Portugal e Castro Câmara v. Portugal, Application no. 53139/11). The Court noted that, although the Art. was “strongly worded”, it was a reaction to a public attack that rested upon a “certain factual background”. The Court also referenced the right of individuals taking part in debates on matters of general concern to have “recourse to a degree of exaggeration or even provocation”. Finally, with regard to the criminal penalty imposed, the Court found: “Having regard to the circumstances of the case, the Court considers that the applicant’s conviction to a criminal fine, coupled with damages, was not proportionate ”. • In 2016, a woman named Maria de Lurdes Lopes Rodrigues began a three-year prison sentence for aggravated defamation, aggravated insult, false accusation and offence to a collective person, body or service (Criminal Code Art. 187). Her conviction related to a series of criminal complaints that Lopes Rodrigues filed against a number of public officials, including a number of judges as well as the former Portuguese attorney general, in which she accused the officials of having participated in “robbing” her of a scholarship opportunity in the late 1990s. Lopes Rodrigues had come in second in a scholarship competition but was not given the scholarship after the original winner declined. She pursued the case, during which time allegations of misconduct in the running of the scholarship competition emerged. Several years later, a court ruled that there had indeed been irregularities, but that the passage of time rendered the impact null. Lopes Rodrigues then filed the criminal complaints. She was charged with the aforementioned crimes and given a three-year suspended prison sentence, conditional on her receiving psychiatric treatment. Lopes Rodrigues refused treatment and was ultimately handed an unconditional prison sentence . 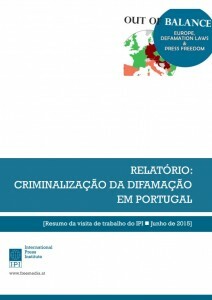 Information for Portugal was originally collected by IPI as part of the “Out of Balance” report, published in January 2015 with support from the European Commission and incorporating research contributed by Center for Media, Data and Society at Central European University in Budapest and by the SHARE Foundation in Belgrade. This entry was later expanded and updated by IPI as part of a study commissioned by the Office of the Representative on Freedom of the Media of the Organization for Security and Co-operation in Europe (OSCE). A fully footnoted version of this entry is available in the OSCE study. This entry was last updated in March 2017. The information contained in this database is for informational and advocacy purposes only. If you are a journalist facing a defamation claim, you should seek legal advice from a qualified attorney. However, if you are unable to find such an attorney, IPI may be able to assist you in doing so. Please contact us at info(at)ipi.media.